60 | TH E M R EP O RT O R I G I NAT I O N S E R V I C I N G DATA G O V E R N M E N T S E C O N DA R Y M A R K E T THE LATEST DATA The Growth of Nonagency Loan Originations The nonagency, nonqualified mortgage market is ripe with opportunity and is expected to double in size this year. 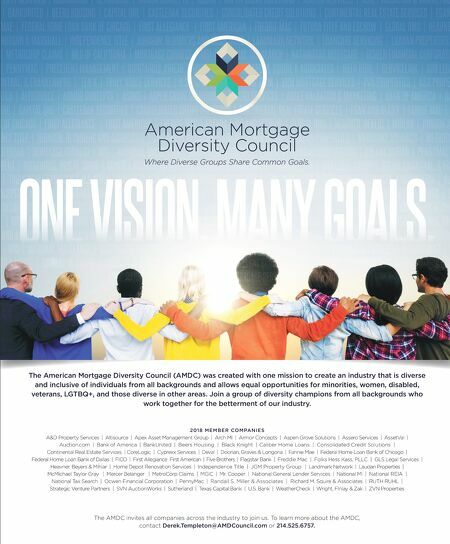 By Ben Wu E veryone is talking about the growing nonagency/ nonqualified mortgage (QM) market. While non-QM loans currently rep- resent approximately 3 percent of the market, many industry experts, including the MBA and S&P Global Ratings, have pre- dicted the non-QM market will again double in size this year. Early nonagency/non-QM loans have performed well, with extremely low delinquency or default rates, and are being pooled into private-label residential mort- gage-backed securities (RMBS). In Q1 2018, we saw $6.28 billion in issuances of nonagency RMBS, which was more than double the activity in Q1 2017. The trend isn't driven by new entrants (yet), but instead by larger players who have been in the market for the past few years issuing more securitizations. Caliber Home Loans, for example, issued its first 2018 securitization in January, nearly three months ahead of its 2017 deal. The $401 million transaction, dubbed COLT 2018-1 Mortgage Loan Trust, included 865 high-balance mort- gages mostly originated last fall to borrowers with slightly blemished credit or loan terms that do not comply with the QM rule. Today's nonagency loans are not like the ones that went into private-label RMBS leading up to the crisis. In fact, the average nonagency borrower has a loan balance of $436,000, FICO score of 699, loan-to-value (LTV) of 79 percent, and debt-to-income of 38.7 percent. Also, these loans undergo not only a significant amount of underwriting to vet the borrower, the property, the numbers, etc. These borrowers are creditwor- thy. And their inability to obtain financing through conventional channels creates a significant op- portunity for astute originators. Nonagency Opportunities S econdary market takeout options continue to expand, both regarding the types of products offered and the aggre- gators offering them. In addi- tion to jumbos, which were the only game in town initially, the market now has alternatives like interest-only options, fix-and-flip and foreign national programs, as well as products for bor- rowers who've had a "recent housing event," such as a short sale, foreclosure, or deed in lieu. There are also products for borrowers requiring alternative forms of income documentation, such as 12/24-month personal or business bank statement and asset depletion documents. 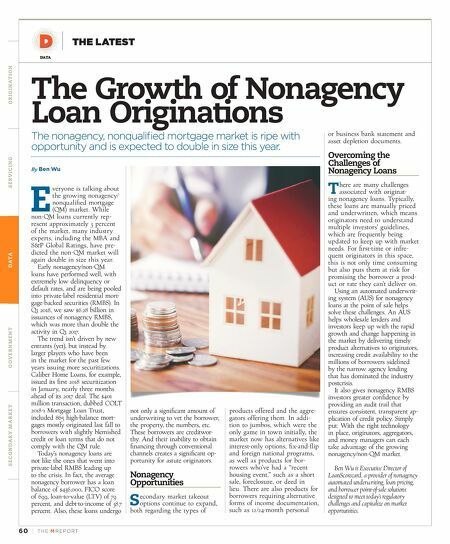 Overcoming the Challenges of Nonagency Loans T here are many challenges associated with originat- ing nonagency loans. Typically, these loans are manually priced and underwritten, which means originators need to understand multiple investors' guidelines, which are frequently being updated to keep up with market needs. For first-time or infre- quent originators in this space, this is not only time consuming but also puts them at risk for promising the borrower a prod- uct or rate they can't deliver on. Using an automated underwrit- ing system (AUS) for nonagency loans at the point of sale helps solve these challenges. An AUS helps wholesale lenders and investors keep up with the rapid growth and change happening in the market by delivering timely product alternatives to originators, increasing credit availability to the millions of borrowers sidelined by the narrow agency lending that has dominated the industry postcrisis. It also gives nonagency RMBS investors greater confidence by providing an audit trail that ensures consistent, transparent ap- plication of credit policy. Simply put: With the right technology in place, originators, aggregators, and money managers can each take advantage of the growing nonagency/non-QM market. Ben Wu is Executive Director of LoanScorecard, a provider of nonagency automated underwriting, loan pricing, and borrower point-of-sale solutions designed to meet today's regulatory challenges and capitalize on market opportunities.